You can also use any type of plastic bottle (HDPE, LDPE, PP). 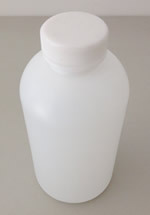 A small-neck bottle will generally seal better than large-neck bottle but both are fine. We no longer recommend adding a small amount of NaOH to the sample. This was a necessary step in the process of dissolved inorganic carbon (DIC) precipitation but not for the gas strip method used by our lab. Please let us know if your samples contain salt or have been in the proximity of any location using labeled 14C (artificial 14C). The collection and/or shipping containers must be new and were not previously used for any purpose. We cannot accept seawater samples that have been treated with mercuric chloride (HgCl2) or sodium azide (NaN3) because we do not have the disposal capabilities for these toxic substances. Beta Analytic is offering Oxygen-18 and Deuterium stable isotope measurements for water samples at no additional cost for samples submitted for radiocarbon dating. These analyses can also be ordered on a standalone basis without radiocarbon dating. 1. Collect water at the wellhead. 2. 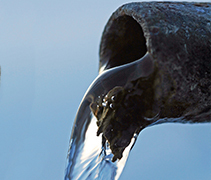 Before beginning the collection from the wellhead/spigot, allow the water to run for sufficient time so that the water being collected has come directly from the aquifer. Depending on the depth of the well, this may be several minutes or longer. 3. Allow the well water to flush out the inside of the bottle thoroughly and then dump the contents prior to ​re​filling. 4. Fill the bottle with as little head space as possible but leave the neck of the bottle empty to allow for any expansion during shipment. 5. Place a tape seal around the cap/bottle joint to ​​​prevent exchange or loss of CO2 from the water. – Please mark the bottle with the appropriate sample identification number in indelible ink or on a non-removable tamper-proof label. – There is no need to refrigerate stored water samples. – Do not add any chemicals to the water upon collection. Before placing the bottles in a sturdy cardboard box, please put the bottles inside a plastic bag and seal the bag with a zip-tie or duct tape. If any of the bottles leak during shipment, the water will not weaken the box. Please use a box with sufficient packing to prevent breakage during shipment. We recommend commercial courier or ​registered ​first-class mail when sending the samples to the lab. Please email the courier and tracking number so we can monitor your package. Radiocarbon analysis of groundwater can be a monitoring tool to prevent the over-pumping of the aquifer before it becomes contaminated or overexploited. Contrary to theoretical models and after-the-fact contamination data from chemical analysis, natural level radiocarbon analysis “offers empirical data that can be used” to make decisions on the future of water districts before damage is done. Groundwater radiocarbon dating is used in combination with the primary measurements of classical hydrological and chemical analyses. Groundwater dating will produce the best results when it involves multiple measurements or sequential sampling. The most useful data come from these comparisons and not from absolute ages. For multiple measurements, the apparent ages of the groundwater taken from pumps that are at varying distances from the aquifer outcrop could be a means of verifying flow rate and also indicate situations of over-pumping. For sequential sampling of an individual well every six or twelve months, any changes in the apparent age of the water are plotted versus time. If the age of the water is getting younger as monitoring progresses, it would usually be due to a drawing-down of the more shallow water layers. Radiocarbon dating has the potential of giving advance notice of impending contamination by surface layer waters.